Following the earthquake, the government handed out 15,000 Rupees (150 USD) as an immediate grant to buy materials for transitional shelters. The cash, meant to buy construction materials, was only enough to buy 8 pieces of Corrugated Galvanised Iron (CGI) sheets—barely enough for a small roof. Looking at the context, we created a do-it-yourself manual in Nepali and English for transitional shelters with flexible and diverse designs that encourage homeowners to build transitional homes using salvaged materials from the destroyed home plus 8 sheets of CGI sheets. The manuals were distributed free of charge through various platforms including newspapers, pamphlets, websites and social media. It is estimated to have directly reached of more than 30,000 families. 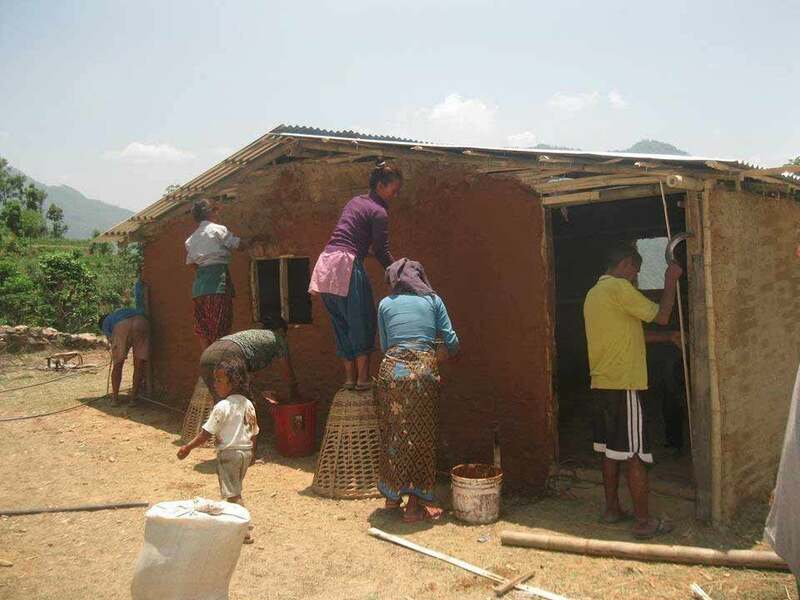 Our barefoot architects and builders went to over 20 villages in Sindhupalchok and Kavre to teach local communities ways to make transitional shelters. We heard from numerous partners and well wishers that they had used the manual to build similar homes in different parts of the country. In Kiwool, Sindhupalchok, our barefoot consultants, with local support provided by ActionAid Nepal, used our free open source designs to build over 1600 transitional shelters. The stones, bricks, wood, bamboo along with the doors and windows were reused from the previous home, and the walls were made from local resources available, such as thatch or bamboo weave. Similarly, the foundation of these shelters range from concrete, PVC pipe and plastic. In this manner, the designs were flexible, diverse and cookie cutters. Moreover, they helped in empowering villagers, and in taking pride in their own ideas and constructions. These shelters are expected to last up to two years and can later be transformed into cow shed or multipurpose storage area for the owners. The beauty of this project is after 2 months of our intervention, the project moved on in autopilot mode—hundreds of homes are now being built using the technology and information that we have disseminated. Thulo Kancha Sunwar-34, a farmer from Chittre, Ki-Wool - 5, Sindhupalchowk is rebuilding his house by implementing techniques learned from the model transitional shelter.